Extradition from Mauritania has happened at last – and not to the Hague or France. 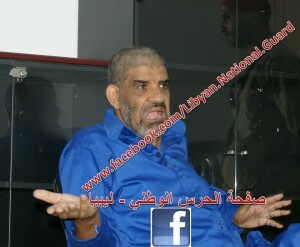 A healthy (and smiling) al-Senussi has arrived in Libya for trial. It is reported that he will first undergo a full medical examination and then interrogation for the cases for which he has been charged. Senussi apparently did not expect the extradition and was told by the Mauritania government only that he was to meet with a Libyan official. He “dressed neatly” and was surprised – shocked – when turned over to the Libyan authorities. He apparently calmed down and was quiet during the flight. The Libyan Prime Minister El Keib has stated that everyone should know that Abdullah al-Senussi and all other members of the former Gaddafi regime brought to justice will receive a fair trial in Libya. Senussi arrived in Libya by private jet at 14:45 local time and was taken directly to a high security prison. He will be held at Al Hadbah Prison with other former Gaddafi regime members including former PM Maghmoudi. Muammar Gaddafi’s former right hand man, head of Libyan intelligence and brother-in-law,Â al-Senussi is wanted by the ICC on charges of war crimes. Three Libyans were originally indicted by the ICC for incidentsÂ occurringÂ early on in the Libyan Revolution of 2011. One of the indicted, Muammar Gaddafi, was killed outside Sirte in October of last year. His son, Saif al-Islam Gaddafi, has been imprisoned in Zintan since his capture and is due to stand trial there this month. Abdullah al-Senussi was also sentenced in absentia by France for the 1989 downing of a UTA airliner which killed 170 people. note: A special thank you to @FromJoanne for on the spot tweeting and to Libyan Youth Movement for Facebook coverage.